During summer, I can’t say no to a scoop or two of ice cream. So when Mark Dow’s latest Happy Days blog post, No Choice about the Terminology: On pleasure, perception and the language of ice cream came to my attention, I knew it was time to analyze the quintessential all-American summer treat: the ice cream sundae. The Oxford English Dictionary defines an ice cream sundae as “A confection of ice-cream topped or mixed with crushed fruit, nuts, syrup, whipped cream, etc.” Mark Dow’s Celebrity Pizza manager defined it simply: “As soon as you add a topping, it’s a sundae. You got no choice about the terminology.” It seems like everyone concurs: a sundae is ice cream topped with something. According to “The Official Website of the Ice Cream Sundae” (who knew the Ice Cream Sundae could have its own website??!) 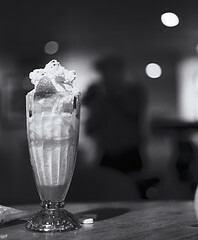 the first sundae was created in 1882 in Ithaca, New York. On some Sunday that year, Chester Platt of Platt & Colt Pharmacy served the Reverend John M. Scott a scoop of vanilla ice cream in a champagne saucer topped with a cherry and cherry syrup. Apparently Scott, the Unitarian minister, named the concoction a Sunday, but the towns of Two Rivers, Wisconsin, Manitowoc, Wisconsin, Buffalo, New York, Plainfield, Illinois, and Norfolk, Virginia all claim to be home to the first ice cream sundae. Concerning the switch from Sunday to sundae, Norfolk, Virginia, claims that its city ordinance prohibited the creation of the “Sunday Soda Menace” along with alcohol, so an ingenious soda fountain owner began making ice cream sodas sans soda—ice cream, berries, and syrup in a glass. This “dry” soda was thus coined a sundae. Peter Bird’s book The First Food Empire, (2000, Philimore, Chichester, England) states that the name ‘sundae’ for ice cream with toppings was adopted from Illinois state’s early prohibition of ice cream consumption on Sundays, but ice cream with a topping that obscured the main product was not deemed to be ice cream. According to Michael Turback, the creator of IceCreamSundae.com and author of A Month of Sundaes and The Banana Split Book, Ithaca can provide the first documented claim to the Sunday/sundae, an advertisement placed by Chester Platt in the Ithaca Daily Journal on April 5, 1892 for the “10 cent Ice Cream Specialty,” the Cherry Sunday, and the switch from Sunday to sundae is most likely due to legislation like Norfolk’s. The exact location and date of the creation of the sundae, however, is likely to remain obscure.